I have looked at the Disney pieces on the Typo UK website for the longest time now but I have never got round to making an order until last week. I think that everything is quite reasonably priced, I feel like I got a quite a few items for the amount of money I spent. I spent just over £25 which meant that the delivery was free. If you spend under £25 then the Standard Delivery cost is £4. I signed up to the website which meant I was sent a 20% off code to use. I would definitely recommend doing this! Typo quite often have different offers available so it is worth looking before placing an order. I was very impressed with the communication and the speed of the delivery of my order. I placed the order on a Friday morning and received a text from Typo a few hours later telling my it would be delivered the following Monday. I was given the option to change my delivery preference if it wasn’t suitable. It turned out that I wouldn’t be in on the Monday so I decided to change my delivery to be picked up from a store. I selected my local Malatan as the pickup location. I was then sent a confirmation text to say that my order would now be delivered to Matalan (still on the Monday) and that they would let me know when it had arrived and what ID I would need to collect it. I was really pleased that the order came so quickly especially for free delivery! 100% happy with the service I had and I would definitely order from Typo again, especially knowing that I don’t have to worry about not being at home for the delivery. Now on to what I purchased… The first item I put in my basket is a pen. I love the typical Mickey Mouse shaped pens you can get in the Disney parks and I use mine all the time. When I saw that Typo had one in a similar style I knew I had to have it! They have a rose gold one, which is the one that I purchased. They also have a gold one if you aren’t a fan of rose gold. What I was most pleased about was that they both write in black ink 🎉 The pen cost £2.50 full price. I did noticed when it arrived that it is quite a lot smaller than the Disney Parks pens in the similar style. The Mickey Mouse shape is smaller, the pen is slightly shorter and it is also thinner. Actually prefer the size of the Typo one as I find the it easier to write with and I’ll definitely be ordering more when this one runs out. The metallic colour has chipped off significantly over time but for £2.50 I can’t complain too much. I also bought a couple of notebooks. Each notebook cost £3.50 each before discount. Although I do love the design of the notebooks, they aren’t the most amazing quality. Although they are a reasonable quality for the price. The paper is quite thin and the notebook itself is quite flimsy. I will be keeping mine at home so it isn’t really an issue for me. However, if you are wanting a notebook that will last when you are pulling it in and out of your bag with everyday use, it might not be the best option. I had seen the first one on Instagram and I love it so much! It is absolutely perfect. The Mickey Mouse ice cream design really reminds me of Walt Disney World which I love ❤️ It has a bright pink insert at the beginning of the notebook which has a pocket on either side. The back of the notebook is the same bright pink colour. The other notebook is a Mickey Mouse design. and I bought because I was instantly drawn to the design when I saw it online plus I love Mickey Mouse, but who doesn’t. The design is even better in person in my opinion. I love it! It also has an insert at the beginning of the book which has a pocket on each side. The back of the notebook is a plain black colour. 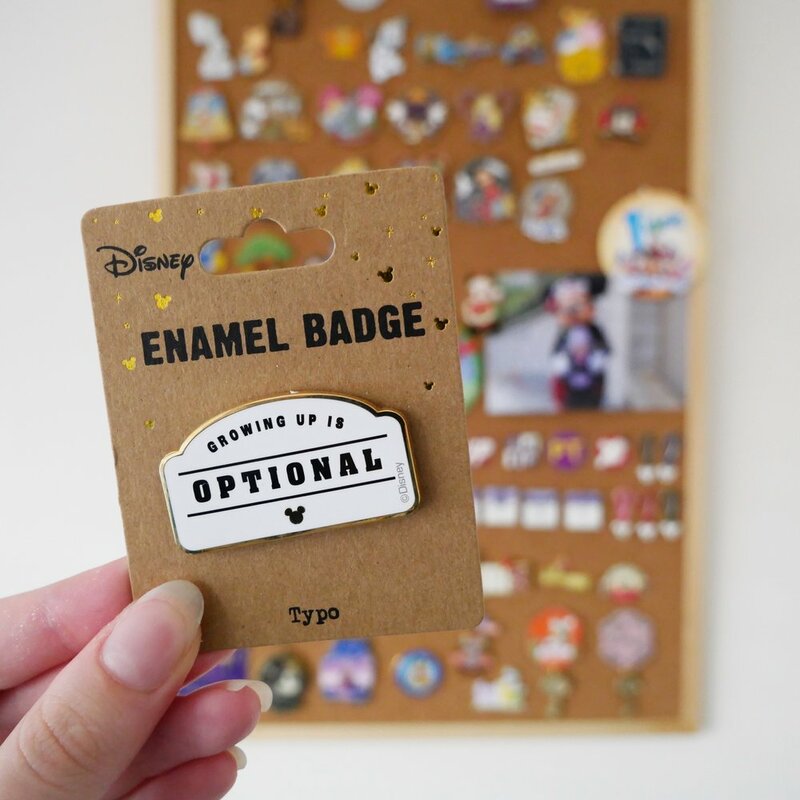 I remember seeing that Typo had a few different Disney badges ages ago and one in particular stuck in my mind so I went looking for it as soon as I decided I was making an order. I was so happy to see they still had it! I love that it has a subtle Disney kind of style so it is perfect for everyday wear. Plus the quote is definitely true. The design name is ‘LCN Growing Up‘ and it cost £3.50. I love love the design of this ‘Archie bag’ so much. It is one of my favourite Disney designs that I have seen in a while. As I have never seen it in real life I wasn’t sure if £12.00 would be too overpriced for what it is. With the 20% discount it cost £9.60 which seemed more justifiable and I couldn’t resist getting it purely based on how much I loved the design. I was not disappointed when it arrived. I would definitely have paid £12.00 now I have seen it. The bag is a beautiful quality and as I mentioned, I’m a little bit in love with the design. It folds up really easily using press studs rather than having to fit it into a tiny little pocket like a lot of foldable bags. The size is perfect for everyday use as either a shopper bag or your everyday tote bag. A lot of tote style bags don’t zip which always puts me off them, but this one zips all the way across which is perfect! I also love the little detail of the Mickey on the zip. If I had to pick a favourite from this haul, which is very hard, I would pick this bag. If you don’t particularly like the style I picked, they also have another Mickey Mouse design here. When I am out and about I tend to end up not feeling well because I can’t drink as much as when I am just at home or work. I use a 1000ml water bottle at work and go through it multiple times a day if that gives you any idea just how much drink each day! I decided to buy this Metal drink bottle (350ml) to use when out and about as it seemed the perfect solution to my problem. I wasn’t sure how big it would be when I ordered it, all I knew is it held 350ml. I decided to order it anyway because I again loved the design and decided to keep my fingers crossed for a useable size. It is perfect! Exactly what I was looking and hoping for. I love the design on the front which matches the bag. It is very classic and subtle Disney but I love the quote so much. The bottle is the perfect size to keep in your bag or attach using the clip. It is metal so works with both hot and cold drinks. 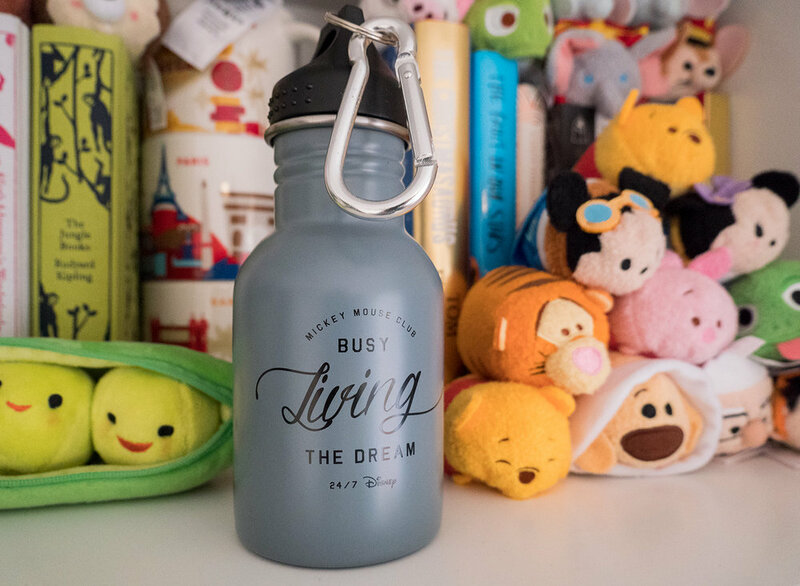 I have taken a photograph of the bottle next to two of my mugs from the Disney Store to help give a rough idea of the size. It is the same size as my hand, roughly 18cm tall from the bottom to the top of the cap. The bottle cost £7 and they have a few different Disney designs if the one I ordered isn’t quite your style.